I'd like to try quilting with my embroidery machine. 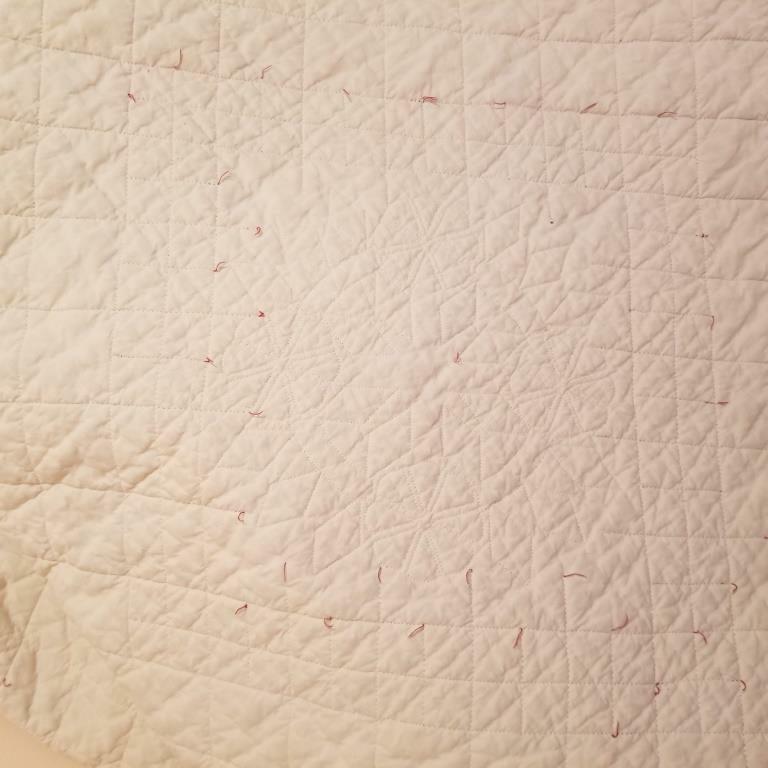 I've seen a few videos and it doesn't look too difficult once you get the details and settings sorted out, but what concerns me is that nobody shows what the back of the quilt looks like. I'd love to try some simple redwork or sashiko designs, but can anyone tell me what it will look like on the back? Also, can I use any type of batting or does it work better with pure cotton? Are there any books on the market that address this? Please, if you've done this would you chime in with your experiences? Thanks!! There are different methods for emb quilting. Do you already have designs from a vendor? You can make almost any emb design into a quilt. You can use any batting that you like in the quilt. If you are using embroidery designs, there is usually a placement line for the batting and back ground fabric. Then a tack down stitch is done. The design is stitched or appliques are applied depending on the details. When I make the blocks as mentioned above, I piece them together into the quilt top. Any batting or stabilizer is trimmed out of the seam line to avoid bulk. Then a backing fabric is cut according to size. I send my quilts out for the final finishing touches. The backs of these blocks are not pretty with bobbin thread and knots. It all hides easily in the quilting process. Some of my quilts have an added layer of batting for more definition to the emb design. The other option is called edge to edge. I haven't done that yet so not sure of how to describe the technique. I hope this helps give you a few answers. Yes you can. Are you considering what I consider regular embroidery designs that are done with multiple colors or the single design lines that look more like quilting Stencil designs. Many machines have the latter built in. There are also collections on a cd that can be downloaded. Some years ago at one of the quilt conventions, the single line designs were used in a class. Benartex and Bernina also had a collection of these designs. After saying all this it depends on which type you want to do. When this question is answered then I might be able to give other suggestions. I do 'edge to edge' with designs by https://shop.ameliescott.com/ and I love it, but they are quite difficult with quilts larger than twin. So I have done QAYG and even do my borders and add them at the end. I very much like the way mine look, but it is just line/redwork type quilting. Amelie Scott has a video showing how to do the edge to edge stitching. I have an embroidery machine and have made quilt blocks on it that I then pieced, if that is what you’re talking about. I have not used it to quilt as in free-motion quilting though I’ve looked at the Amelie Scott products for doing that. My machine has built in quilting designs, I just have no idea how to use them....yet. 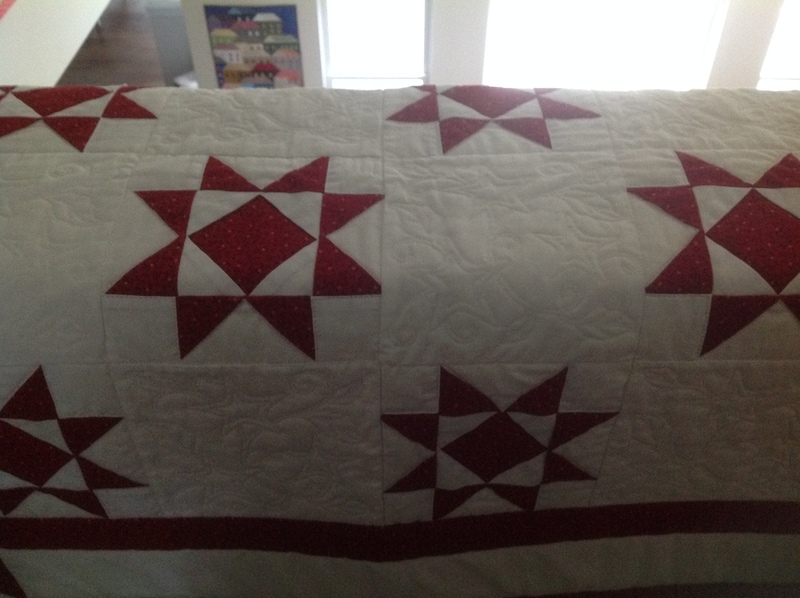 I did embroidery on a queen size Lone Star quilt after it was sandwiched. Cotton fabric, poly batting. I used quilt feathers embroidery designs. If you are doing the embroidery after it has been sandwiched....mark your design centers on your quilt before you sandwich. I found it easiest to print the designs out, pin them in place, & then mark centers with a +. Then hoop all 3 layers, no stabilizer needed. The thickness of the fabrics & batting will be enough. Thread your bobbin for regular sewing & with the same thread as the top. This will make the back of the design look almost like the top. If possible chose designs with few or no jump stitches. The downside is keeping the weight of the quilt off the embroidery arm of the machine. I used my ironing board next to my machine to support most of it. Slow your machine down, so you have better control of the quilt while the arm is moving. Use scrap fabric & batting & do a few test runs first. Others have posted how to do QAYG blocks or Applique'. the appearance of the back will depend on the embroidery you do. if you do the multi-colored embroidery that uses satin or other fill stitching (flowers, for example) the back will be a mess. if you use quilt-motif files, single-run motifs will look almost exactly as they would if you had done them FMQ or on a long-arm. the only difference is that there will be little knots where each motif finishes. (there can be more if the motif isn't completed in one full run.) if the top and/or bobbin thread(s) do not match the backing fabric the knots will be visible. you'll have to decide whether or not to trim off the little "thread flags" at each knot. i rarely do. i figure anybody who is bothered by them can spend the time it takes to hunt them down and snip them. if i do snip them myself i put a dab of fabric glue on each one and don't snip until that's dry. use a glue that won't wash out and that dries invisibly. the photo below is the back of a quilt i use on my sofa. top thread was red, bobbin white. if you use a double-run motif, in addition to the little knots you will most likely have pin-dots on the back. the only way i know of to prevent that is to use the same color thread in top and bobbin. the size quilt you should attempt will depend on your machine. theoretically i can do a king-size on mine because the hoops go up to 9-1/2" x 14" and the throat height should be enough. having just wrassled with an oversized twin, though, i think i'll divide anything larger into QAYG sections. i still need to experiment a bit more. it might be easier if i use polyester batting instead of cotton. Thank you Feather3...that was what I was looking for. I have some practice sandwiches made so I guess I just need to jump in and do a few. Last edited by hobbykat1955; 04-27-2018 at 04:11 AM. This is basically how I use my embroidery machine to quilt. Embroidery library has a great video showing how to do it. My friend bought her embroidery machine specifically to do quilting. Since then she has discovered the saying most of us have, "If it stands still, embroidery it". I have a Husqvarna Viking Topaz 20. While I have tried some FMQ, and will use SID if it fits the design, I am more comfortable using embroidery function on my machine. There are MANY embroidery patterns available for E2E and all block sizes designed specifically for quilting. 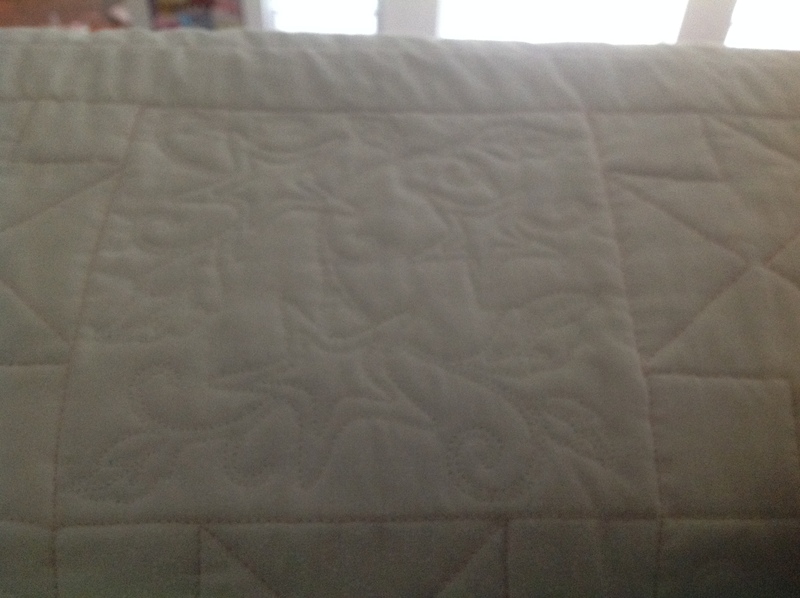 I have quilted many sizes up to a queen size quilt on my embroidery/sewing machine. I set up on my kitchen table to support the weight of the quilt. I sandwich and spray baste my quilt. I have grid templates for my hoops that help my center or align the design. I use thread in the bobbin that matches the quilt back. 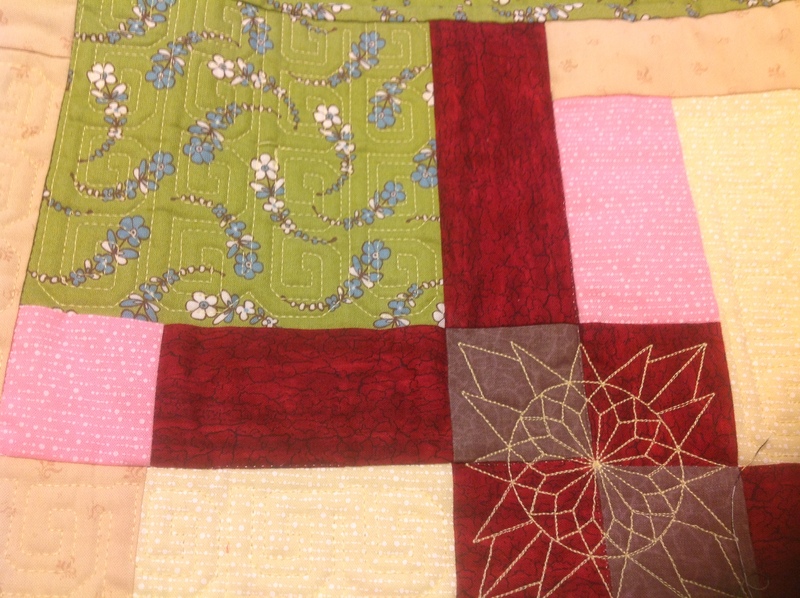 This has been the best of both worlds for me, as I started off doing QAYG, sandwiching and quilting each block, and then sewing the quilted blocks together. This is very difficult to do well. Front looks great, back not so nice. Looks a little better if you sash each block. 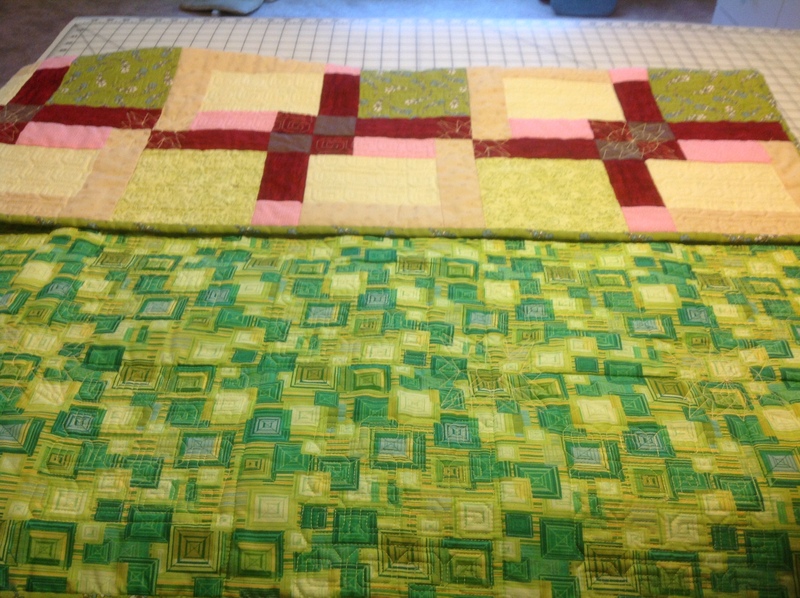 Using the kitchen table to support the quilt has made it possible for me to machine quilt queen size quilts. While I wouldn't say it is easy, it is definitely doable. You can also use your embroidery machine to applique. I made a Baltimore album quilt using applique embroidery patterns that came out beautifully even though it was only my 3rd or 4th quilt. The backs of the quilts look great (IMHO). You do have to trim the jump stitch threads, but that is not difficult or a problem. Go for it! Last edited by TAMARATJO; 04-27-2018 at 05:43 AM. You've gotten such good advice here. For me, single color, more of an outline design, sometimes called redwork (can be any color) works the best. You center the area you want to quilt. The next step is to hoop or tape or pin your quilt to the embroidery frame. Next do the embroidery, making sure you support the quilt so that the embroidery frame can move freely and pulling up the thread from the bottom as you start the embroidery. I start from the center out. If you start on one side, everything will shift no matter what you do. If you want some more elaborate embroidery, then perhaps you want to think about adding the full backing after you have finished all the embroidery and do a stitch in the ditch to anchor the backing to the completed front. Practice the design(s) at least once so you can see any problems that might develop. I look forward to seeing your end results. fyi....my friend uses her embroidery machine for baby quilts all the time. She does little teddy bear outlines, stars, horses..just whatever theme she wants with her piecing. It looks good. There is a lot of great advice here. Like the others here said, there are several ways to do this. when I did it, I also embroidered the blocks before incorporating them into a quilt...QAYG style. I put the backs on after I embroidered the blocks. That way, the back didn't matter. Hobbykat, yours looks fabulous. Mine didn't look that good. I must try, try again. Patrice, yours also looks way better than mine! Last edited by mindless; 04-28-2018 at 09:07 AM.